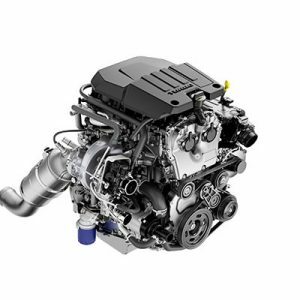 General Motors plans to add a new turbocharged inline four-cylinder engine to the redesigned 2019 Chevrolet Silverado 1500 when it reaches dealers this fall. It will be the first turbo for the automaker’s flagship pickup truck line. The 2.7-liter engine was developed just for GM’s trucks and was designed to offer a peppy small engine that could deliver a balance between power and fuel economy. “This will be a great advantage for us in the market place,” said Sandor Piszar, Chevrolet truck marketing manager. The new engine is rated at 310 horsepower and 348 pound-feet of torque and will come standard in the LT and RST trim grades, replacing a 4.3-liter V6. The redesigned Silverado equipped with the small engine will deliver 0-60 mph acceleration in less than seven seconds and weighs 380 pounds less than the current Silverado with the V-6, Chevrolet said. 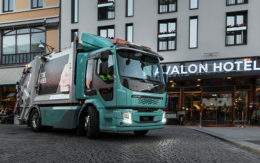 The automaker said its payload capacity will be competitive with full-size V6 engine trucks from Ford and Ram but did not provide data. 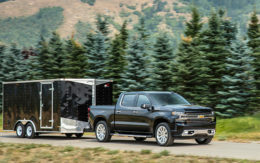 Chevrolet also did not offer towing capacity, fuel economy or pricing details, saying those will come before the truck goes on sale. Ford uses turbocharging technology in its trucks to boost the power, performance and fuel economy of some V6 engines. Trucks.com took the new Silverado equipped with the turbo engine for a short drive at GM’s Milford, Mich., proving grounds Thursday. The truck proved to be lively and agile. It offers stronger acceleration than the previous 4.3-liter V6. The lighter, smaller engine improves the weight distribution of the truck and enhances its driving characteristics. The engine has an aluminum block and cylinder head to reduce mass. The eight-speed automatic transmission is smooth and efficient. Drivers won’t feel it search for a gear. They will rarely even notice when it is switching gears. Ford’s experience adding its turbocharged EcoBoost V6 to the F-150 line and seeing strong consumer response proved that truck buyers are willing to give new technology that delivers improved performance and fuel economy a chance, Brinley said. “Once a consumer drives the 2.7-liter four-cylinder in the Silverado, its benefits versus the V6 should overcome any preconceived objection to a four-cylinder full-size truck,” she said. But by including the 2.7-liter in only two models Chevrolet is not positioning this engine as a true alternative for those who demand the towing and payload of a V8, Brinley said. One impressive feature of the engine is its quick acceleration with almost none of the lag or delay that shows up in many turbo engines. Tom Sutter, chief engineer of the engine, said that’s the result of an improved design. It employs what GM calls an advanced dual-volute turbocharger. Rather than using a single spiral chamber, or volute, to channel exhaust gas to drive the turbine on the turbocharger, the system has a pair of separate chambers with individual exhaust gas inlets and nozzles to drive the turbine and increase engine power. The design allows the exhaust pulses of the engine to be leveraged for a faster spool-up, Sutter said. “Think of two grandparents pushing a child on a playground merry-go-round from separate sides. It’s going to go faster,” he said. The engine also has a fuel-saving cylinder deactivation allowing it to run on just two cylinders in situations like cruising down a highway where less power is needed. The truck will also be the first Chevrolet truck with an electric water pump. Sutter said it helps the engine’s performance by eliminating the power drain that comes with a conventional engine-driven water pump. Piszar said he estimates about 10 percent of Silverado buyers will opt for models with the turbo engine, or 50,000 to 60,000 trucks annually. It’s likely to show up in other GM trucks and large SUVs. 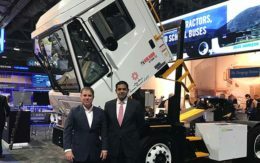 While Piszar declined to talk about future uses for the engine and other models, he said that new engines are expensive to build and that automakers tend to leverage their investments across large volumes of vehicles. Starting with the Silverado 1500, GM is redesigning its entire line of Chevrolet and GMC brand trucks, including its popular Tahoe, Suburban and Yukon SUVs, which are based on the Silverado platform. A new Tahoe is expected next year. GM is not being transparent in the way they are marketing this and other upcoming power trains for 2019 and the media is allowing their plays on words exaggerating customer choice. Firstly, while it’s true there will be a total of 6 power trains in the lineup, they are in no way planning to give the same amount of choice or value that Ford offers with F150. An F150 customer isn’t forced into one or two choices by category. With GM- branded half tons, there will be the low category, ironically called “high value”. It’s ironic, because the two power trains available in this category are the same as what is sold today in the current Silverado and Sierra truck; whereas Ford let’s a customer choose from 4 engines from the lowest trims and configurations, and all but the base comes with a ten speed. The result is that an F150 customer can get the top-billed 3.5 V6 twin turbo and latest transmission for less than $35K or pay less than $29K with the base and a six speed or either of the two engines in between. But with GM, in this “value” category, customers have the choice of the same old V6 and V8 with the Same old transmissions and same old cylinder deactivation systems. But it doesn’t end there. The next category still doesn’t even allow the latest and greatest or most capable power trains. The “high volume” category gets the new 2.7 turbo or 5.3L V8 but with 8 speeds and the same old cylinder deactivation. Finally, once a customer opts for pickup models in the “high feature” category where pickups are the price of a median home where I live, GM will offer the 6.2L with the 10 speed and new cylinder deactivation or the diesel and the ten speed. This is all a huge contrast between F150 and Silverado/Sierra, yet few are calling GM out on this. You can’t bring on a new engine that’s not even available until the 4th trim level up and call it a base engine and additionally try to compare it to Ford’s base engine, because it’s inferior performance wise to Ford’s smaller turbo and more expensive than Ford’s base. Ford’s 2.7L twin turbo Ecoboost is their #1 selling power train; mostly because it is available from the bottom up to Lariat trim where it becomes standard; it is the gas- powered mpg leader in the class; it has 400 ft- lb torque; and Ford promotes it’s sells via incentives and high inventories in many models. GM is shooting for 10%. That’s roughly what Ford sells in base 3.3L V6 models.